A few weeks ago a Smitten Kitchen’s profound question crossed my Facebook feed. “Is there anything that isn’t better with chocolate?” I assume it was rhetorical. Who could answer no? Her recipe that followed for Double Chocolate had me immediately thinking everything is better with chocolate and necessary at this exact moment. I was on my way home from a weekend Boston and while I had no plans to do anything but order a pizza and binge in front of the couch, I instantly knew it had become a baking night. What I love most about banana bread is how easy it is. Let your oven preheat for 10 minutes while you dump everything into a bowl and mix. Further dump that mixture into a loaf pan, then go ahead and binge on the couch with that pizza while it bakes for an hour. We call it a bread but let’s be honest, we’re really looking at a cake with a bit less sugar. To trick myself that the cake bread was a bit healthier, I swapped some whole wheat flour for all-purpose and applesauce for butter. Another tip I picked up somewhere along the road was when making chocolate cake, especially one without icing, is instead of buttering and flouring the pan, butter and cocoa it. There’s nothing more upsetting than a beautiful chocolate loaf, specked with white powder. Heat your oven to 350°F. Butter a 9×5-inch loaf pan and dust with cocoa powder. Mash bananas in the bottom of a large bowl and whisk in melted butter, brown sugar, egg and vanilla. Sift in baking soda, salt, cinnamon, flours and cocoa powder and mix until just combined. Stir in chocolate chunks or chips. Pour batter into prepared pan and bake 45 minutes until a tester or toothpick inserted into the center of the cake comes out clean. 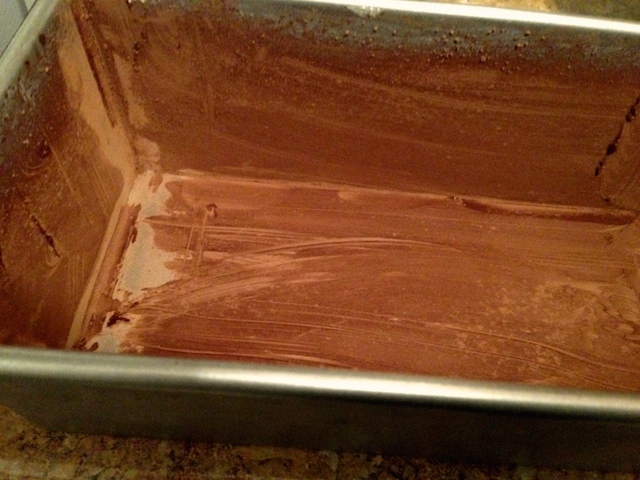 Cool in pan for 10 to 15 minutes, then run a knife around the edge and invert it out onto a cooling rack. Serve warm or at room temperature. 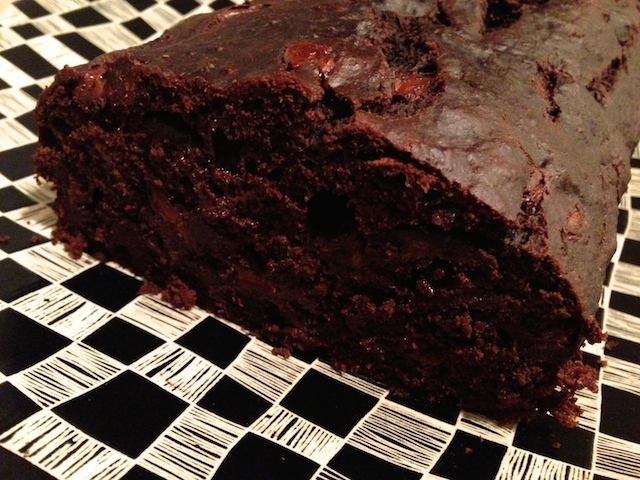 It looks great, I have never made chocolate banana bread/cake. It looks perfectly moist and delicious! Thanks Suzanne! It was tasty and the extra chocolate at breakfast is certainly a treat! Whoa. 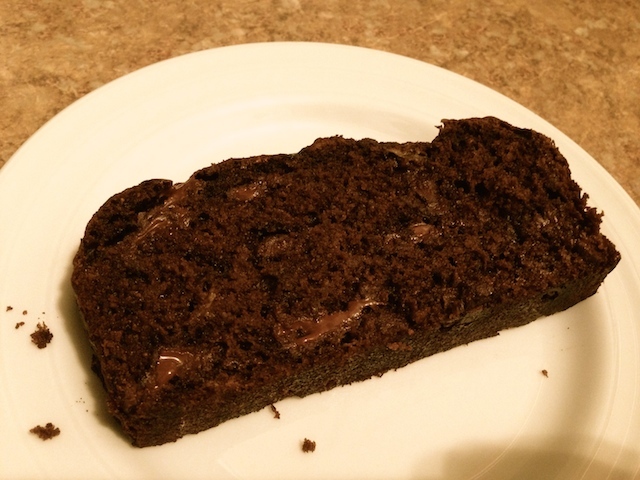 Banana bread with double chocolate? I think I’ve somehow ended up in heaven! Your loaf looks delicious Mel. Love those molten chocolate drops, *sigh*! Thanks Laura. I need to collect some more overripe bananas and make some more!